Shady politics, conflicts of interests and austerity measures make European Court of Human Rights practically incapable to deal fairly with individual applications about violations of the Convention for the Protection of Human Rights and Fundamental Freedoms. In fact, right to the individual petition before ECHR is a broken promise. According to a 2008 speech of the Court’s former President Jean-Paul Costa, the proportion of 94% of inadmissible cases reveals an anomaly. Now, the same way as a decade ago, the Court declares inadmissible vast majority of applications without any reasoning and fails to provide at least brief reasons for the decisions delivered by a single judge, as was announced at the 2015 high-level Conference on the implementation of the Convention in Brussels. No measures are taken to analyze and satisfy with due respect public demand for justice, expressed in so-called inadmissible applications. Commenting to Pravdoshukach Newspaper total and unreasonable rejection of applications, ECHR press unit wrote: “It has been true since the entry into operation of the Convention system that a very high percentage of applications have proved to be inadmissible. If this is indicative of an anomaly, then the anomaly lies in the failure of applicants and sometimes the lawyers representing them to fully understand the formal requirements of admissibility as set out in the Convention, such as the obligation to exhaust national remedies. There is also frequently an inability to grasp what rights are protected by the Convention or again an ignorance of very settled case-law. In 2011 the Court had in the region of 100,000 cases pending which were identified as inadmissible. Today that figure is around 6,000 because following the entry into force of Protocol No. 14 and the empowering of a Single Judge to take inadmissibility decisions, the Court was able to give a decision in these cases thanks to the introduction of a summary procedure that allowed the reasoning to be reduced to a bare minimum. Following the Brussels Conference and having brought the massive backlog of inadmissible cases under control, the Court introduced a system (from May 2017) which enables it to give more reasoning for inadmissible cases. That is the situation today for the great majority of decisions declared inadmissible”. We can’t share such views of colleagues in ECHR press unit. It reminds contradictory implications in other speech of ex-president Costa at the London School of Economics in 2013, when he says that ECHR don’t select the cases because people are free to apply, and within the hour he says also that ECHR selects priority cases because the Court must deal not with all cases, but with “the most important” of it in the context of international politics and diplomacy. Honestly, it is not true, that applicants or their lawyers are to blame for high inadmissibility rate. So-called formal requirements of admissibility given by ECHR can’t be trusted, because in practice very similar applications are treated differently. Furthermore, pompously announced in several press releases of the Court “system” of “more reasoning for inadmissible cases” simply doesn’t work. So-called formal decisions of inadmissibility proudly provided to some applicants since 2017 include no explanations what exactly admissibility criteria they breached, nor even refer to any details of the application. These decisions typically are shorter and less informative than a cover letter of ECHR Registry (in fact, such decisions just printed at the back side of a cover letter); even in Ukraine, with all our problems with access to justice, inadmissibility decisions of courts isn’t so blank and useless. 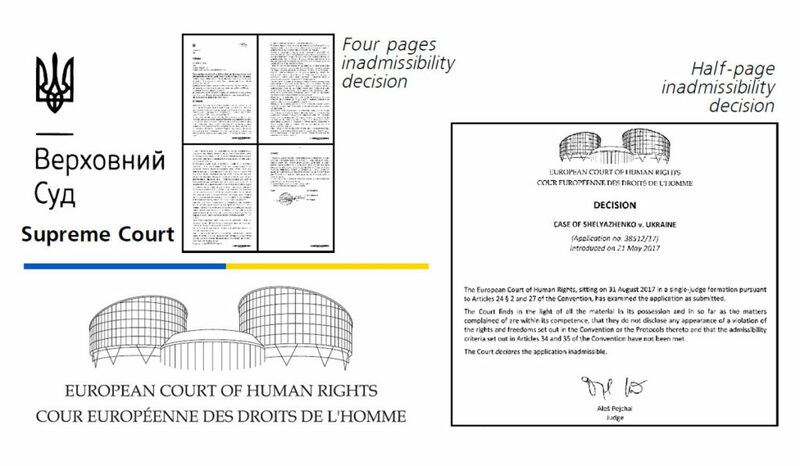 If you sent three applications to ECHR during the same year, two are rejected and one accepted for further consideration, you can’t even understand from ECHR Registry letters or “formal decisions” which one is accepted and you can’t inquire it because the Court refuses to communicate with applicants; described situation is known by own experience. If you a lawyer representing hundreds of applicants, imagine what a mess creates such judicial uncertainty during many years of proceedings. Ironically, the Court may punish you via disbarment for own delays and incommunicability, finding you in abuse of right to petition, because the Court deeply weakened rules of procedural “hygiene”, speculating about intentions of applicants and lawyers to mislead the Court without any objective evidence, as explained Dutch judge Johannes Silvis in 2014 concurring opinion in the case of Gross v. Switzerland. Baseless accusations in fraud addressed to Ms. Tselovalnichenko is the predictable result of such absurd policy. Despite ECHR stay the most active and successful among international tribunals, it also outrageously similar to less advertised brothers in selective justice and arrogant elitism. Instead of improving own effectiveness and accountability, the Court seeks excuses to wave away applicants: arbitrarily interprets inadmissibility criteria; imposes ridiculous amount of formal requirements (including mandatory 13-pages application form to fill digitally but mail printed), oriented to weed out almost all applications; appreciates absurd claims of State parties and prioritizes cases in political interests manifestly abusive to human rights, such as mutual interest of the Russian and Ukrainian governments to inflame the war and cement authoritarian regimes, using international justice as theatrical scene to claim own sanctity and demonize sparring partners in militarist race. ECHR press unit wrote us “this is a typically broad, inaccurate and unsubstantiated allegation which does not call for a response”, but no concrete person dared to put own name under such sort of response. Instead, we can name respectable authors who openly criticize ECHR in academic publications for disrespect to individual applications and consequent deviation from the Court’s mission to defend human rights. For example, Janneke Gerards, professor of Utrecht University School of Law, wrote an article with the title “Inadmissibility decisions of the European Court of Human Rights: a critique of the lack of reasoning” in Human Rights Law Review emphasizing that single-judge decisions are hardly reasoned, nor are they published. In the article “Measuring the judicial performance of the European Court of Human Rights” published by the International Journal for Court Administration Elizabeth Lambert Abdelgawad, associated professor of the School of Business and Law of Edith Cowan University, wrote that ECHR has been forced by the governments to downsize its budget and staff; this has resulted in detriment of quality and of the service rendered to individual victims. Such policies, intended to reduce the number of pending cases, considerably eroded the right of individual application. In her view, the Court blindly acts as if already its only clients were states, with individuals downplayed as mere whistleblowers. The Court itself in 2012 judgment in case of Kharuk and others v Ukraine claimed that “its principal task is to secure the respect for human rights, rather than compensate applicants’ losses minutely and exhaustively”, so the Court clearly refused to treat individual applications responsibly. Such shameful reasoning has deep roots in economic institutionalism, that claims people are no more than parts of the economic mechanism, creating scam institutions deceptively imitating care about the people but depriving all the people secure and happy life for the sake of opulence of small privileged elite. Institutionalist machinations in the law were famously criticized by U.S. Supreme Court judge Oliver Wendell Holmes Jr. who refused (in 1905 dissent in the case Lochner v. New York) to misinterpret the Constitution for imposing particular economic theory. Former ECHR registrar Erik Fribergh at the seminar for “results-based budgeting” claimed the Court’s budget is insufficient to ensure the States members of the Council of Europe comply with their human rights obligations. According to his speech, instead of fulfilling such “too far-reaching and wide” mission the Court may just deliver qualitative judgments in few of the many cases, implying the vast majority of cases will be neglected without consideration. Interestingly, economic excuses of the Court’s inefficiency are very controversial. Let’s compare performance indicators of ECHR and of Supreme Court newly created during judicial reform in Ukraine. In 2018 with a budget near 70 million euros ECHR received 43 100 applications and delivered judgments for 2 738 cases (6% ratio). Our new Supreme Court in the same year had an annual budget near 38 million euros but received more than 150 000 cases in which delivered 49 480 substantial judgments (33% ratio). So, domestic justice of high authority in Kyiv 2 times cheaper and 5 times more decisive dealing with 3,5 bigger caseload than international justice in Strasbourg, and besides, our judges explain fully reasons for inadmissibility (typically, it is 2-3 page decisions), as general rule, demanding applicant to fix formal mistakes in application during the next 15 days, so only 10% of applications found inadmissible after all. 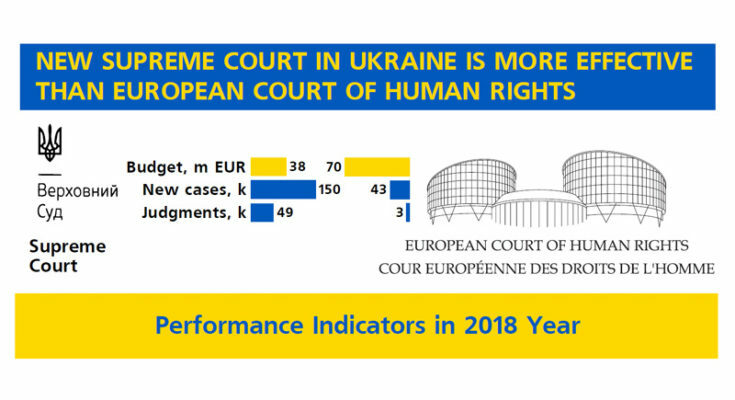 Technical efficiency of Supreme Court can be explained purely economically: in Kyiv, applicants pay a court fee, so Supreme Court is interested to serve the applicants, but in Strasbourg the States finance the European Court of Human Rights and they interested to make ECHR reject maximum amount of individual applications against the States. Ex-president Costa in 2013 speech characterized the Court’s activity as judicial diplomacy. His sincerity explains a lot, not just because diplomats serve firstly the governments and secondly, maybe, the people, but also because diplomacy is an art of consensus at the cost of truth, but justice is an art of uncompromised truth. Justice demands to avoid conflict of interests according to the ancient principle “Nemo judex in causa sua”, this phrase in Latin means: no-one should be a judge in his own case. But Convention and Rules of the Court demand of judges to participate in consideration of the cases concerning the States they represent. Furthermore, initial filtering of individual applications is given at the mercy of “legal professionals at the start of their career”, “dealing with individual applications originating from their own legal system, written in their own language” (quotes from “The Assistant Lawyer Scheme” booklet at ECHR site). In result, almost all applicants are doomed to be brutally rebuffed by the next generation of the legal elite of their own nation, turned into manikins for young inexperienced bureaucrats skills training. Of course, inter-state applications never dealt in such manner and can’t be declared inadmissible by a single judge. You can’t even dream about the procedural equality of the State and the Human in this “human rights court”. In the scandalous story with caviar diplomacy, political bosses of Azerbaijan bribed Strasbourg officials with expensive vacations and gifts to make Council of Europe close eyes on severe human rights violations, influencing ECHR and Parliamentary Assembly of the Council of Europe (PACE) Committee on the Election of Judges to the European Court of Human Rights. Observing last visits of ECHR judges and PACE MPs in Ukraine, we perhaps can’t speculate about the flavor of caviar but we definitely must be vigilant. Programs like ECHR assistant lawyers scheme without proper risk management can be sources of unlimited corruption since the power of a humble clerk to choose one admissible application among many and many others in the procedural mess of selective justice sooner or later will attract a big money. Ukrainian judge Ganna Yudkivska was served ECHR Registry assistant lawyer in 2005-2009 years. Now her husband, millionaire Georgii Logvynskyi, openly tries to concentrate in own hands control over all legal aid to the victims of the armed conflict between Russia and Ukraine, including their representation in the cases his wife judged or will judge soon. Wikipedia says that “Georgii Logvynskyi leads a group of lawyers who provide protection and legal assistance to political prisoners, coordinates the work of lawyers and human rights defenders in the occupied territories”; “in 2014, from the very beginning of the occupation of the Ukrainian territories, he consolidated the leading human rights defenders and lawyers and set the Ministry of Justice Expert Council”. Coincidently, before he was elected to Ukrainian parliament and delegated to PACE, he was a partner in the private legal firm (not nonprofit!) named “Association of Lawyers MJ Expert Council”. Wonderful, isn’t it? Maybe the next stage in his business career will be establishing the limited liability company like “ECHR Judge & Partners”. Torn apart by conflicts of interests, the Court can’t deliver justice in reasonable time due to deep involvement in political squabbles. State parties tied hands of ECHR by Copenhagen Declaration, demanding to prioritize national interests before individual rights and hear inter-state cases before individual applications, encouraging the Court to neglect the vast majority of so-called inadmissible applications, especially where applicants have not suffered so-called significant disadvantage. 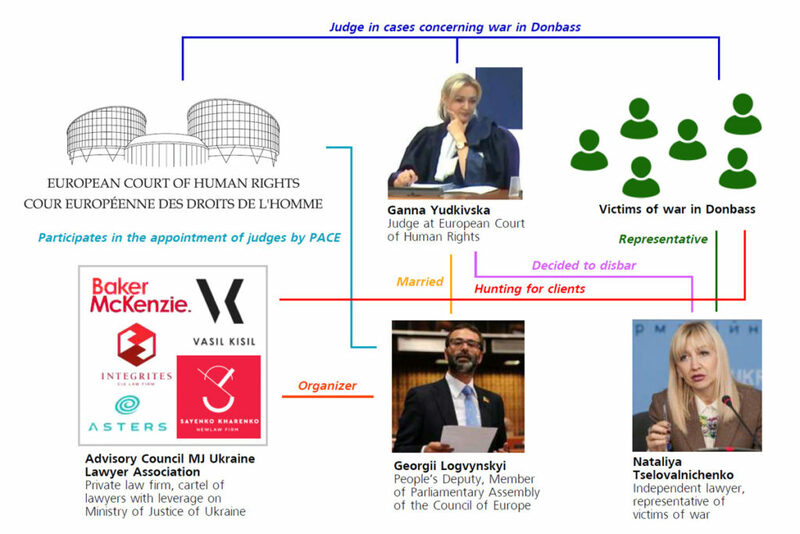 Last 5 years ECHR postpone applications of the victims of the war in Eastern Ukraine bringing more attention to geopolitical agenda than to sufferings of people, but the Court hurried to declare inadmissible in 2016 seemingly legitimate but under-communicated applications in case of Lisnyy and others v. Ukraine and Russia establishing formalistic framework for mass unreasonable rejection of similar applications, even of properly communicable applicants, and, furthermore, disbarred in 2018 lawyer Nataliya Tselovcalnichenko for trying to remind the Court its mission of human rights protection. Commenting on this problem, ECHR press unit wrote: “Again the question is not very clear, but what is true and consistently with the Copenhagen Declaration is that in a situation covered by inter-States proceedings which has also generated large numbers of individual applications, in principle the latter will not be adjudicated until the overarching issues, notably going to jurisdiction, have been decided in the context of the inter-State proceedings. Having said that, in the interests of the sound administration of justice, applications which are clearly inadmissible are dealt with”. In our view, however, the question is clear: hope for justice in ECHR is almost lost for now – so, the question is, how can we restore lost hope for human rights and European justice. Pravdoshukach Newspaper investigation exposed totally unfair and corrupted practices of the European Court of Human Rights (ECHR), sacrificing elementary principles of procedural fairness for the sake of shadowy politics and selective justice. Fair public trial, the presumption of innocence, and evidential proof of guilt beyond the reasonable doubt are universally recognized standards of procedural justice. All this was ignored in the case of Nataliya Tselovalnichenko. This special issue of Pravdoshukach Newspaper is dedicated to corruption and lack of procedural justice in the European Court of Human Rights.